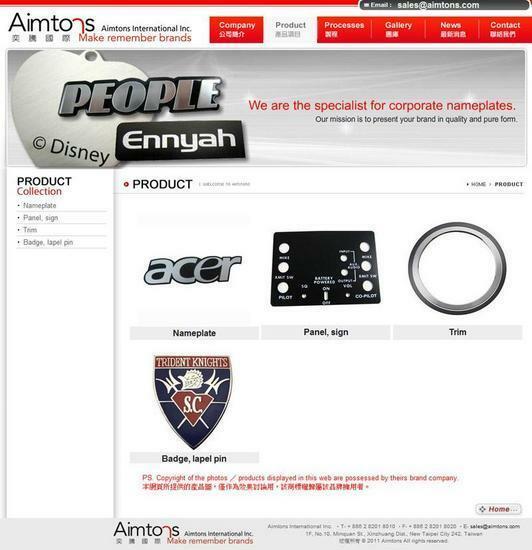 Aimtons International Inc. is gathered by a group of experienced staffs who have worked in the anodizing, spray-painting and nameplate fields over years. We get our start serving regional base of European small business' branding requirements. Aimtons is committed to deliver your branding images in the ideal form. We provide vast choices of nameplate styles aiming to present your company brand an unmistakable look and lasting impression; and also rich types of name plates are customized to meet your low-cost manufacturing budget. Regardless exterior appearance, we realize a functional design is becoming the key consideration when building a customized logo or branding pieces. Aimtons' proficient staffs are striving to find the ideal solutions conforming to your special demand either for harsh environ-ments, durability requirements or official functional testing. Aimtons implements strict process control, careful feasibility analysis, fast turn around and reliable service. Aimtons aims to en-sure you find satisfaction with your logo appears strong, powerful, elegant and sophisticated from us!